As we watch 2018 winding down, following a busy international schedule, we are ever so grateful to be safely home to celebrate this Thanksgiving holiday with family and friends. We are rejoicing in God's faithfulness and love and always so grateful for all of you partners who stand with us. What an amazing blessing to return to Cape Town, South Africa to celebrate 20 years of amazing ministry with Teen Challenge Western Cape. Jacobus and Erica are true pioneers on the continent of Africa. 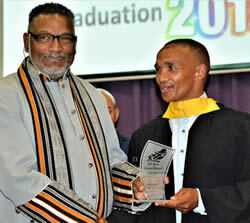 They have had a profound impact, not only in South Africa, but across the continent, and in fact around the world. Their boldness, faithfulness, and willingness to pursue His call “standing strong” for over 20 years are a treasure to the Kingdom. His visionary leadership of Teen Challenge, Hope Revolution and Enon Tabernacle are reaping an amazing harvest that only eternity will reveal. 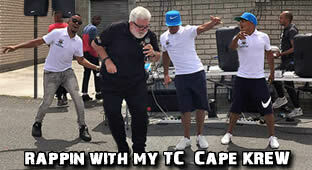 They started by housing addicts in their home and TC Western Cape has become a force for true freedom across South Africa. Cathy and I were honored to present Dr Nomdoe and his lovely wife Erica the Certificate of Excellence in Service commemorating 20 years of ministry on behalf of Dr Nance and the entire Global TC family. 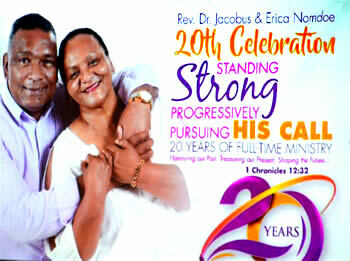 Night after amazing night, we saw incredible ministry as the 20 Years Celebration of Jacobus and Erica Nomdoe rocked CapeTown, South Africa with amazing guests. In addition to street outreach and the celebration, we had a great chapel service with students. 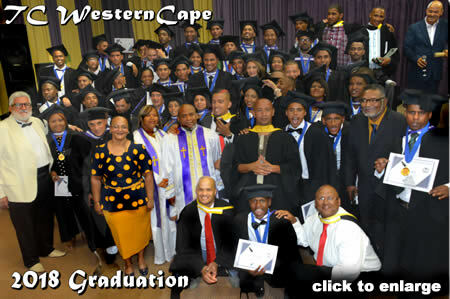 Along with their 20th Anniversary Celebration, the Graduation Ceremony for nearly 50 students from South Africa, Madagascar, and Seychelles. was an amazing demonstration of victory. 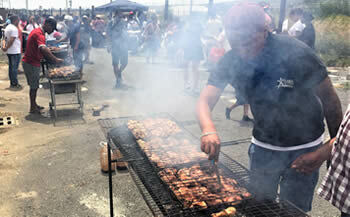 BRAAI--From braaivleis (“grilled meat”), from Afrikaans braai (“to grill”), from Dutch ... braai ...by any other name, this South African barbecue is an amazing taste treat with multiple kinds of meat: beef, chicken and lamb and side dishes and is a just plain DELICIOUS outreach tool for the church and local folks alike. 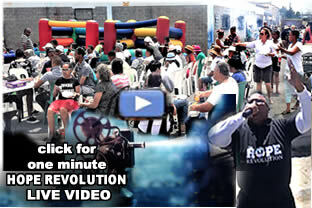 Whether at the Braai or on the street, the Hope Revolution is taking Hope to the Most Hopeless. House to House-Street to street, City to City. 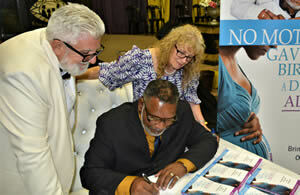 Dr. Nomdoe’s new book, No Mother Gave Birth To A Drug Addict was launched with a book signing in Cape Town. 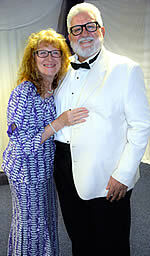 Over 400 were in attendance as he personally autographed hundreds of books. The line of happy and chatty book purchasers extended around the building for over 90 minutes as Brother Jacobus penned a greeting in each one. In powerful literary style, he starts with the premise that no one is born a drug addict. Young people are born created by God with potential, power, and opportunity. 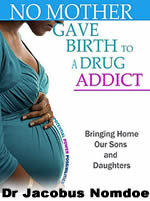 If we label them as addicts for life, it should not surprise us that it RESULTS in addicts for life. He offers revolutionary concepts on how to engage the needs of addicts, based on his life experience and over 25 years of ministry to people with life controlling problems. Laden with scripture, real-life examples and promise, Dr. Nomdoe lays of a case for freedom in Jesus and a strong challenge for every family & church. If they (addicts) cannot find hope, we must make sure Hope finds them. We must bring our sons and daughters HOME! What thanks can we render to God for you in return for all the joy with which we rejoice before our God on your account. As we celebrate Thanksgiving, our first thanks go to God, but also for family and our faithful partners that stand with us. Through a dangerous and challenging fall, you have stood by us with your gifts and prayers. I think we have the most amazing parters in the world and we are able to do our work because of all of you. We thank God for you. As we reflect on our many blessings, have you noticed that we seem to live in an entitled society? Entitlement and thankfulness cannot coexist. The danger that this kind of attitude poses makes this holiday an important part of our national consciousness here in the USA. It is impossible to feel entitled and be grateful at the same time. Thanksgiving turns us from “deserving” to “delighting.”-- from shouting my rights to savoring His grace, from a preoccupation with my needs to great gratitude for the promise of His provision. Thanksgiving is an important time for all of us. Giving thanks works like a vaccine; it keeps us from being infected with a spirit of "entitlement." It's the anti-toxin that counteracts the poisonous effects of self-absorption and ingratitude. That first Thanksgiving celebrated in spite of conflict, sickness and starvation. It was shared by Pilgrims, the native American Wamponoag tribe, Samoset, of the Abenaki tribe, and Squanto. Squanto, was Patuxet, adopted into Massasoit's tribe after his own had been wiped out. He helped the Pilgrims even though he had been captured by the British and held as a slave. Thanksgiving reminds us that we do not walk in revenge but in faith. The first Thanksgiving celebration recognizes God’s faithfulness, where even enemies can gather around the table to express their thankfulness to a sovereign God. Whether loving family, political enemies, or weird Uncle Vito -- through God, there is a place at the table for everyone. We have never needed Thanksgiving more than today in this dangerously divided world. The first colonists did not come to the United States to bring European civilization; they came to escape religious persecution and to bring the gospel of the Lord Jesus Christ to a new continent. Giving thanks is the anti-toxin that counteracts the poisonous effects of self-absorption and ingratitude. In Genesis, God spoke to nothing and created everything. He spoke to darkness and brought forth light, He spoke to an unexplored continent and courageous pioneers brought forth a new nation. The Pilgrims modeled the truth that the primary purpose of life is to glorify God and to give Him thanks. Even when praise and worship seem like a sacrifice, never forget that God spoke into the nothing of our lives and gave us everything. God gave us an amazing promise in 1 Peter 4. We already have all things, so let's be thankful. Rather, it says, "Give thanks to the Lord, for He is good! "1 Chronicles 16:34). "Amen, blessing and glory and wisdom and thanksgiving and honor and power and might, be to our God forever and ever. Amen." Revelation 7:12 (NASB) May God bless you and yours as you celebrate and give thanks to the God of the universe. 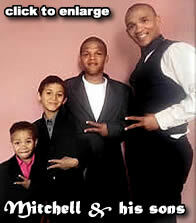 Mitchell was recruited by a gang called "the Firm" at 19. 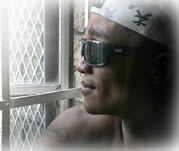 A life of drugs, gangs, and violence in the Cape Flats, (ranked in the top 5 in "Murder Capitals of the World") resulted a in life sentence. In prison, forced to stab a warden to "make his bones" for the gang, God began to work in his life. 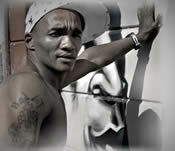 Facing life for 1l attempted murders and possession of fire arms, God did a miracle to get him out of prison. 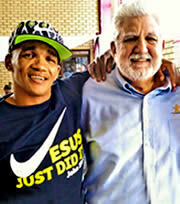 At Teen Challenge Western Cape, God changed his life. What a blessing to see him as a powerful leader, husband, father and man of God. 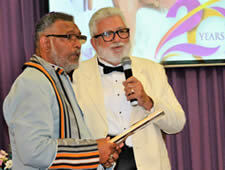 He received an award for 10 years of faithful service to Teen Challenge and the Hope Revolution. GIVE ON LINE -- DONATE TODAY! 2018 has been a year of miracles. If you could not be with us in the Syrian Refugee Camps of the Bekaa Valley, Malawi, Rwanda, South Africa or the United Kingdom-Your THANKSGIVING Gift can propel us into 2019. Thank you for standing with us, praying for us and as the Lord leads, partnering with us through your gifts. my Father which is in heaven. Despite this dangerous world in which we live, the devastation of natural disaster, the tragedy and raging fires this year, God's love and promise remain steadfast and pure. There is no room for us to place ourselves on the throne as judge of God's infinite wisdom and mercy, but we need to release the power of His grace which comes through praise and thanksgiving. As we gather around our tables this Thanksgiving, let us take a moment to remember that Thanksgiving is more than feasting, football, and fun ... take time to reflect on what you can thank God for. Don't miss an opportunity to reflect God's amazing love. 5 Let your gentle spirit be known to all men. The Lord is near. 7 And the peace of God, which surpasses all comprehension, will guard your hearts and your minds in Christ Jesus. 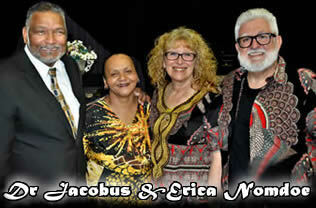 We were blessed to be with our dear friends Jacobus and Erica Nomdoe in Cape Town, October 30 - November 5. God sent a powerful word through some amazing speakers and delivered a tremendous promise for The Nomdoes, TC and the HOPE REVOLUTION. Let us pray that God continues to raise up a powerful voice for freedom across Africa and the world. If they cannot find hope, may we find them with Hope. The Camp Fire that broke out early morning on Nov. 8 was whipped by high winds and moved so fast that at one point it was estimated to have been burning the equivalent of 80 football fields a minute, said Sacramento Fire Capt. Chris Vestal. The number of people killed rose to 76 as search and rescue continued amid the ashes in Butte County. We are relieved to report that after communication with Teen Challenge administrative offices in both Southern and Northern California that no additional Teen Challenge centers have been damaged by this recent inferno. Our Ventura Women's Center was destroyed earlier this year by the wildfires. Pray for staff and students who have people they loved affected by these fires. Let us also pray for the churches and families who lost loved ones and those that will spend a lifetime trying to recover memories lost in their homes devastated by the flames. 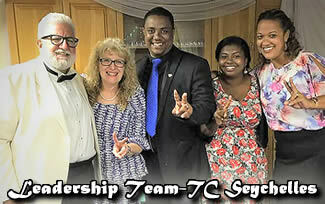 Teen Challenge Liberia is a pioneer of Teen Challenge in West Africa. Despite poverty and conflict, they have been managing to sustain the program and have 18 clients in the in-patient program and for the month of November, 32 out-patient clients. They are presently running a tuition-free Teen Challenge Kindergarten school program for community children whose parents cannot afford to send their children to school. Two TC graduates from the men's center are also giving their voluntary services as teachers to two schools in the community. "presently we find ourselves in a very difficult financial situation that I need urgent help to do some urgent rehabilitation work and for food at the center." You can donate to Liberia by using the GTC link and designating TC Liberia. Please pray for the tens of thousands of people who have experienced such upheaval and loss through the recent storms, tornadoes and hurricanes over the last weeks. Praying that the many ministries that continue to serve in the hardest hit communities will also have many opportunities to share the Good News of God's grace. 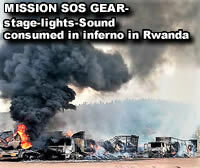 The M*ss*on SOS gear did not make it out of Rwanda. At the border, as the truck awaited clearance, a vehicle lost its brakes crashing into our truck and eight other vehicles. There was a huge explosion, a blazing inferno and the containers, the entire stage, lighting, and sound equipment were consumed. All of the festival gear valued at approximately US$1.5 million has been lost and the system must be reconfigured in time for the June outreach in Tanzania. 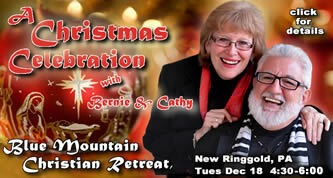 A truck fire will not stop momentum, but they need your prayers and as the Lord leads -- financial help..